Olivia got into the candy early this morning. She wasn't into breakfast but sure did love getting candy from the bunny this year. 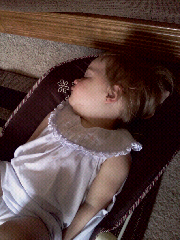 Now, she has crashed and is out.